The van Matt and Alli Owen bought for $8,800 earlier this year, and have called home ever since. At 6-foot-4, Matt Owen is too tall to stand up straight in his own house. But the bright red Mercedes-Benz Sprinter was the biggest van he could find. "This is between 60 and 80 square feet," Owen said, sitting at his kitchen table one recent afternoon with his wife, Alli. At night, the table lowers and cushions are put down for them to sleep on. 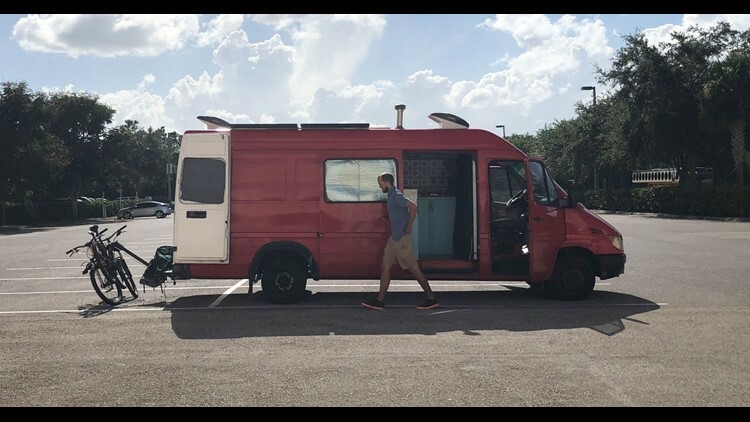 Earlier this year, the two 28-year-olds quit their six-figure jobs as engineers, purchased their van for around $8,800 and began traveling the United States. To do so, they had saved up more than $600,000 in just four years, thanks to a confluence of fortunate circumstances and a commitment to frugality. The Owens fit into a few trends — such as #vanlife, which is exactly what it sounds like: people living in vans, as well as the FIRE movement, which stands for "financial independence, retire early" and is mostly composed of young people who detest cubicles and desire a self-made schedule. Behind the buzz across social media on the phenomenon, just 1 percent of Americans actually retire before age 50. 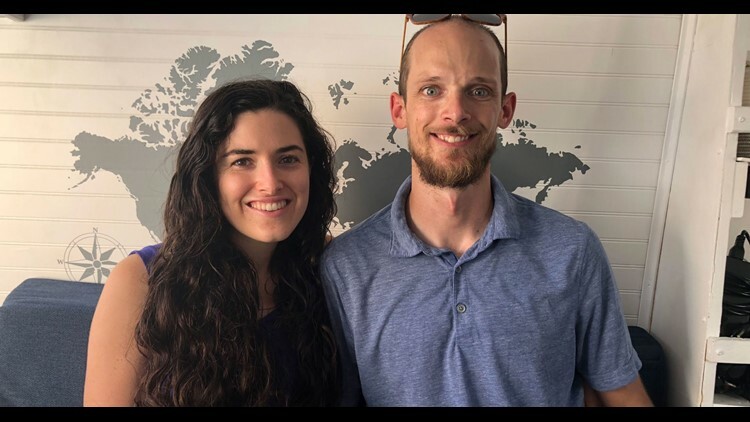 But Matt and Alli Owen now plan to share the financial lessons they picked up over the last few years with other millennial couples, through coaching and a course they've designed. "Our expertise is our own lives and what we've been able to accomplish there," Matt Owen, right, said. At left is Alli Owen. When the couple learned about the FIRE movement online, Matt said he was making $150,000 a year and Alli was making $100,000. They were both engineers. Over time, they managed to save around 70 percent of their income. Of course, that's more feasible when you're making six figures than if your household income is closer to $60,000, which is the median reality for Americans. Between the two of them, they contributed around $36,000 a year to their 401(k) plans, before their employers' match. The rest of their savings went into index funds through investing apps and a Vanguard account. The couple cut back on their food costs by only eating out once or twice a month. Matt said he learned downgrading didn't need to mean loss. "We found we made substitutions, and it didn't reduce our joy at all," he said. "In many cases, it improved it. "We switched to cooking, and we got to spend a lot more time with each other and we built a new skill." Matt sold his car for a cheaper one with better mileage, pocketing thousands more. When the couple traveled, they used credit card rewards and other strategies to keep down the bills. Their week-long honeymoon in Mexico cost them just $800 each, for example. They write on their blog about how they pulled that off. They bought a four-bedroom house in Bakersfield, California, for $275,000 but didn't have to pay their mortgage out of their own paychecks because they rented out three of the bedrooms. 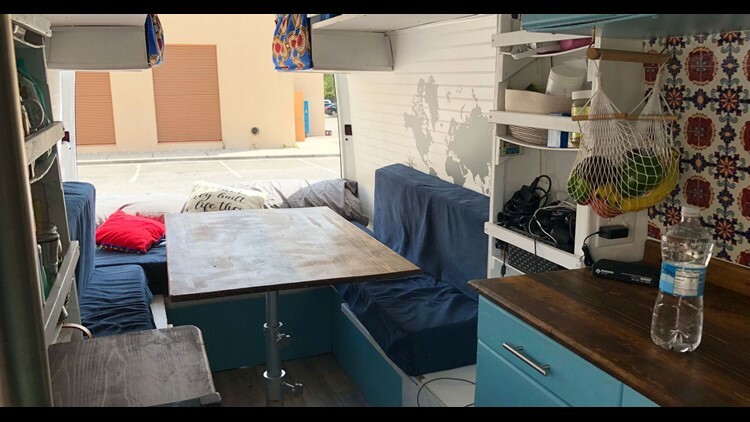 Now that their home is a van, they have no housing costs, and they rent out all four bedrooms of their house, making a profit while the property appreciates. For health insurance, they both use Medi-share, a Florida-based costs-sharing ministry in which members pay for each other's medical expenses as they come up each month. The inside of Alli and Matt Owen’s van. Their initial plan was to retire with $1.2 million. But dissatisfied with their jobs, and finding their labors had left them with $650,000 saved, they pulled the trigger. "We had gained so much confidence in our skills from saving so much money," Alli said. From their van, they've developed an 11-part online course with worksheets, spreadsheets and videos to help people build a budget and bring down their expenses, as they've done. (The course costs around $150 and will be available this fall.) They also plan to meet with people over Skype as they travel, sharing their financial lessons face to face. They acknowledge they don't have any official credentials to give people financial guidance, and they don't offer any specific tax or investment advice. Still, they believe they have wisdom to spread to the three-quarters of millennials in debt, including saving tips and strategies to pull themselves out of the red. "Our expertise is our own lives and what we've been able to accomplish there," Matt said. "We're trying to share that story."